I made these thinking it would be a fun craft to do with the kids. You know, cute little Easter chick and bunny candy pouches. Well, they were so much fun to make that I ended up doing them myself. I think I’ll save them as an Easter surprise for the kids. 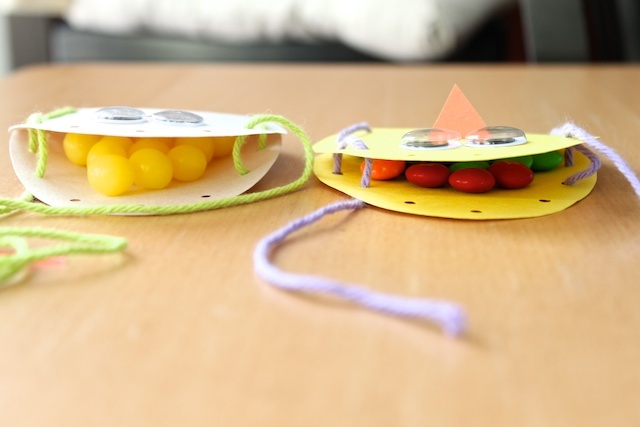 Or the kids can make some for his/her class at school and share them with their friends. It’s so simple to make and you probably already have the supplies at home. And I made the pattern downloadable for you to print from your own printer. If you make something inspired by Simply Modern Mom, please upload pictures of it to our Flickr group to show it off to everyone. You may be featured on Simply Modern Mom. 1. 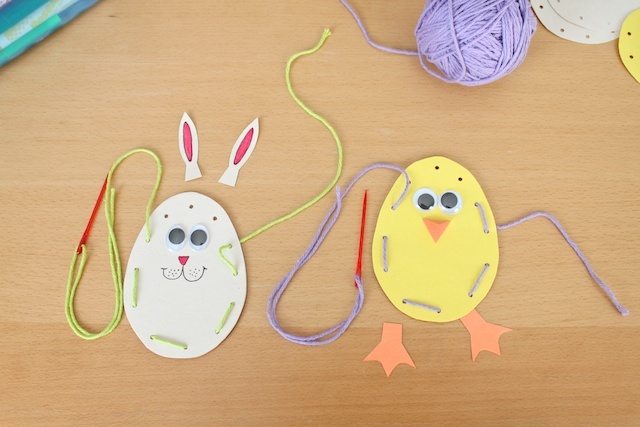 Print the chick and bunny egg pattern (click link to download) and cut out the pieces. 2. 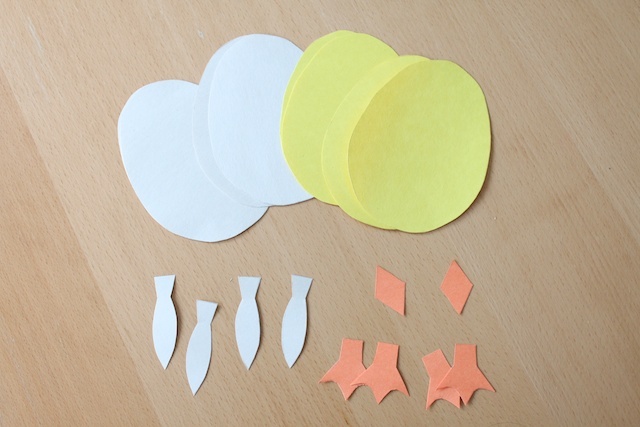 Use the pattern to trace two egg, two bunny ears, two feet and one beak onto construction paper. Cut out the pieces. 3. 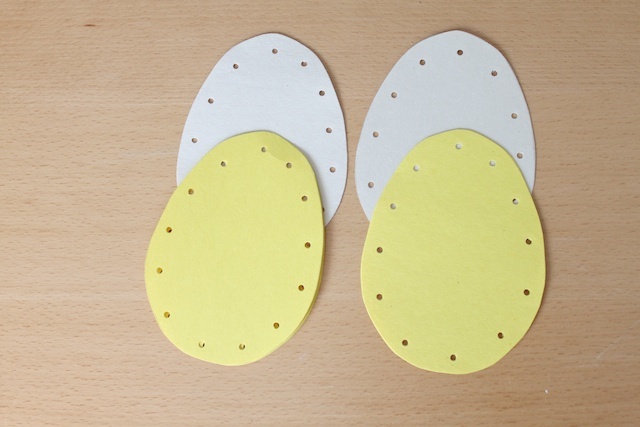 Match the front and back of the egg patterns then punch holes around the edges about 3/4-inch apart. 4. 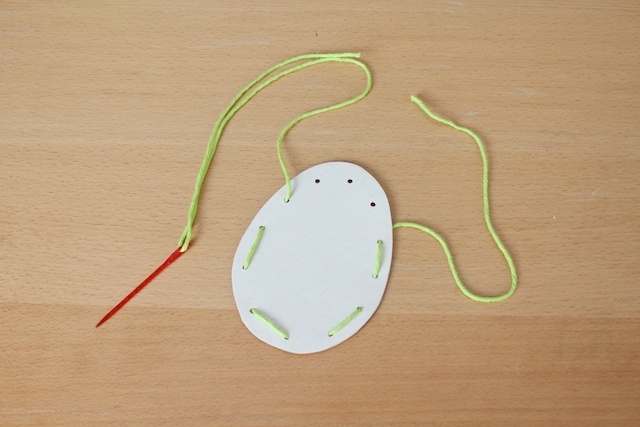 Stitch the egg pattern together using yarn, but leaving an opening at the top. I used a darning needle, but if you don’t have large eye needles, you can always tape the yarn end to help sew through the holes. 5. Glue chick and bunny parts to create a face. For the bunny’s face, I drew nose and mouth then colored the ears with thin markers. Attach the bunny ears and chick feet by gluing it to the back. And fold the beak in half (top point meeting the bottom) then apply glue to the back side of the beak. 6. Using the opening at the top, fill the pouch with candy. Hold the yarn ends while filling with candy so the stitching doesn’t come loose and the candy doesn’t fall out. 7. Pull the yarn tight. 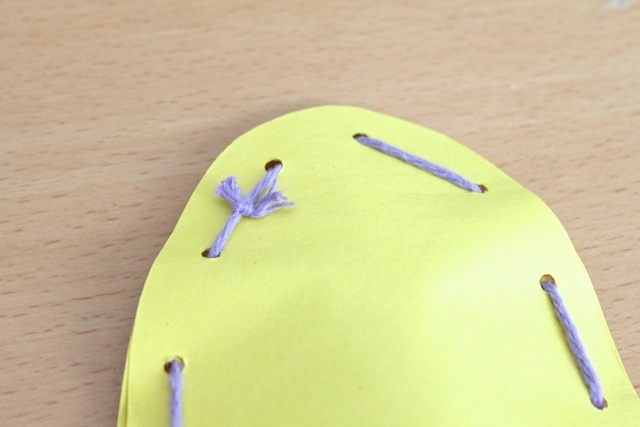 Then sew the remainder top of the egg and tie the ends together on the back. And done! » Tell me… What kind of candy would you stuff these pouches with? What’s your favorite Easter candy? How cute. This kids and I will be making these today for our Easter dinner table setting. Cuuuuuute idea! I think I’d fill mine with stickers! Really cute! I would fill mine with Cadbury mini eggs. The.Best.Easter.Candy.Ever. These are cute, we are going to have to make these! I’m not sure jelly beans maybe, because I have them already. I’m a chocolate girl but dont think that would be very good filler. Had great fun making these with my boys (6yrs and 4yrs). We made them as a present for their little cousin who’s too young for a big chocolate Easter egg. We put a small Freddo and little fluffy chick in each. I’d love to try these using felt, leaving the top open a little to stuff little candies in. Thanks so much for this adorable tutorial. My daughter and I had a great time making these tonight. Thank you so much for sharing!! I made these today with my 4 year old daughter then we rode our bikes to her friends house and left them on their door step. They will have a happy surprise waiting for them when they get home. necklaces. They looked really cute! Such a cute and fun idea! 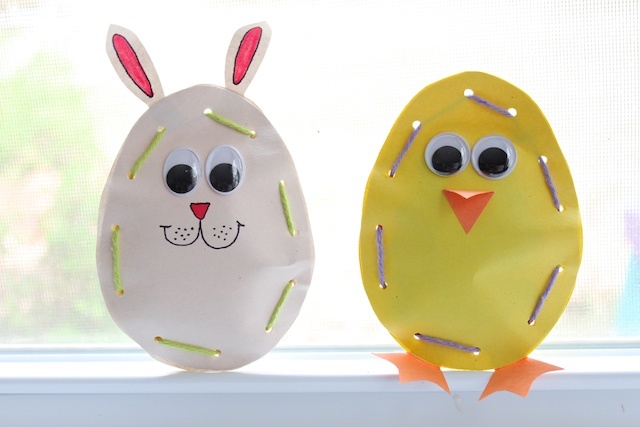 I’m doing an Easter link up today over on my blog…http://rustsunshine.blogspot.com. Would love it if you joined us! Sooo adorable. I know my kids would like those and they would be perfect to give out to their classmates. Thank you for sharing this cute idea, the printable and the good tutorial. I want to make them with my little granddaughter (four and a half years old) who loves to craft with me. I found you via pinterest – my top source for many nice ideas.